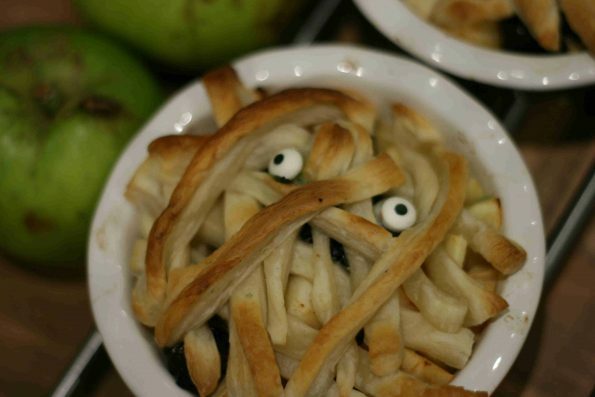 Halloween is the perfect excuse to do some fun baking with kids. 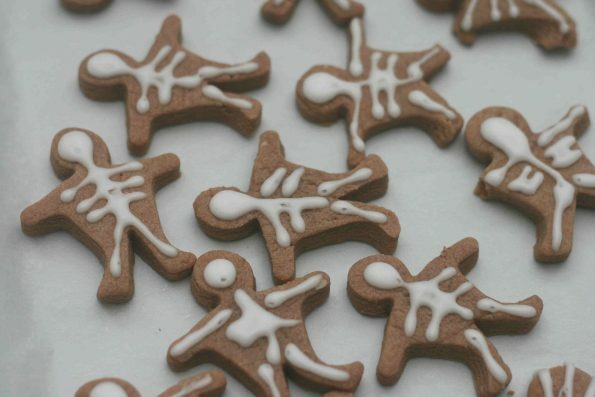 There are lots of really simple things you can do and just give them a spooky twist and these biscuits do just that. 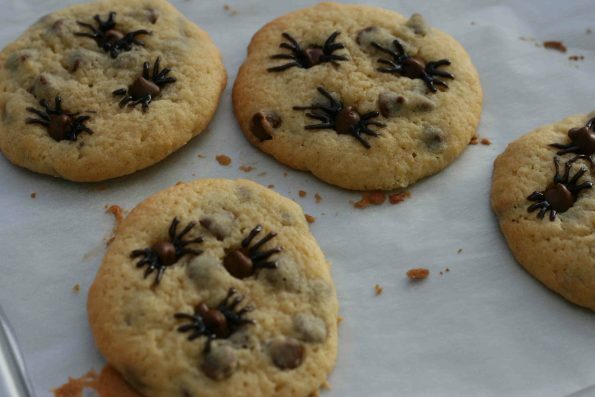 We took an easy cookie recipe and just decorated them at the end with spiders. 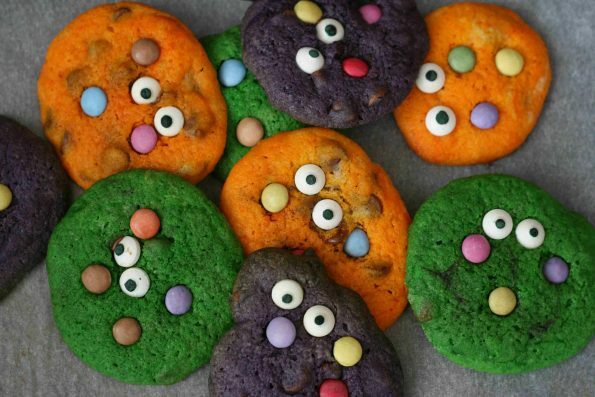 The kids really loved making them and when we shared them with friends at a toddler group they were a real hit! 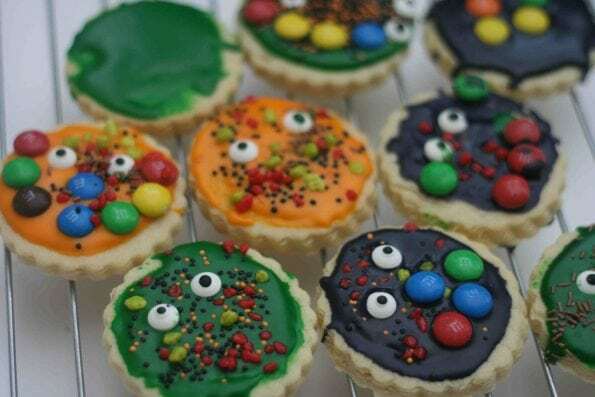 You could use your favourite cookie recipe or a pre-made cookie mix and just add the decorations at the end or follow the recipe below. I found the eyes in a supermarket but if yours doesn’t have them you can find them online. 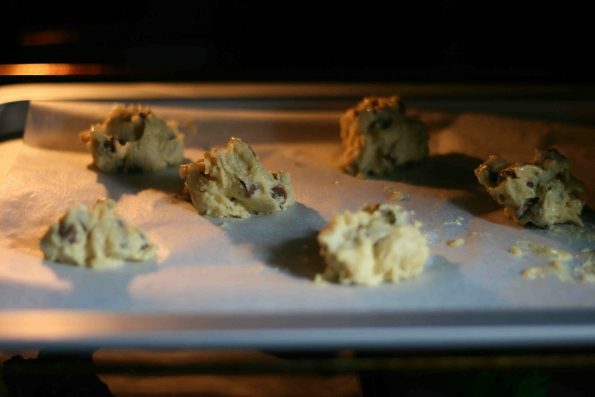 Preheat your oven to 190C/170C Fan/375F and line 3 baking trays with baking parchment/paper. 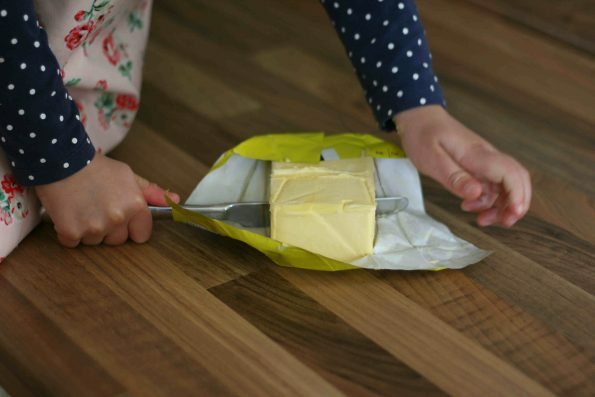 Get your little one to measure butter (100g) and pop it into a large mixing bowl or freestanding mixer. Measure the sugar (125g) and add to the mixing bowl. 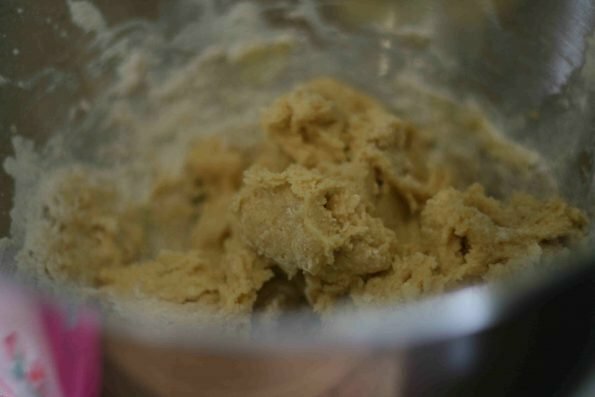 Mix the butter and sugar together until they are evenly blended. 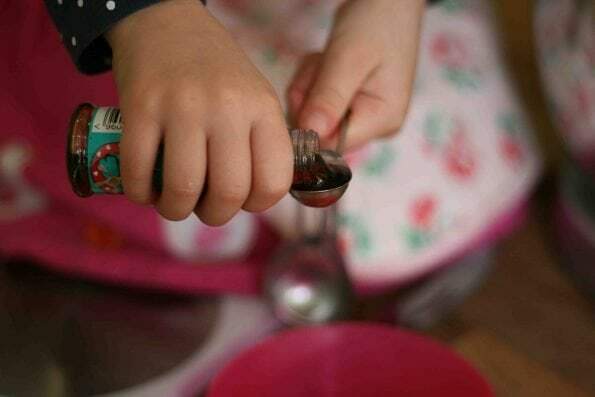 Get your little one to help you measure the vanilla extract (1/2 tsp) and add to your mixing bowl. Crack the egg in a small bowl. Give it a little whisk and then add it gradually to your mixing bowl, beating it well between each addition. 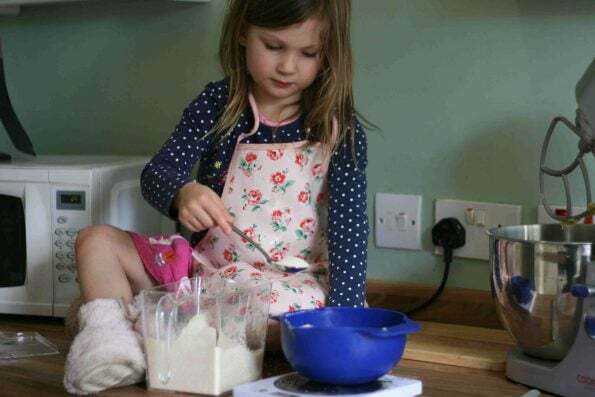 Weigh the flour into a small bowl then add to your mixture. Finally add the chocolate chips and give it one final mix. 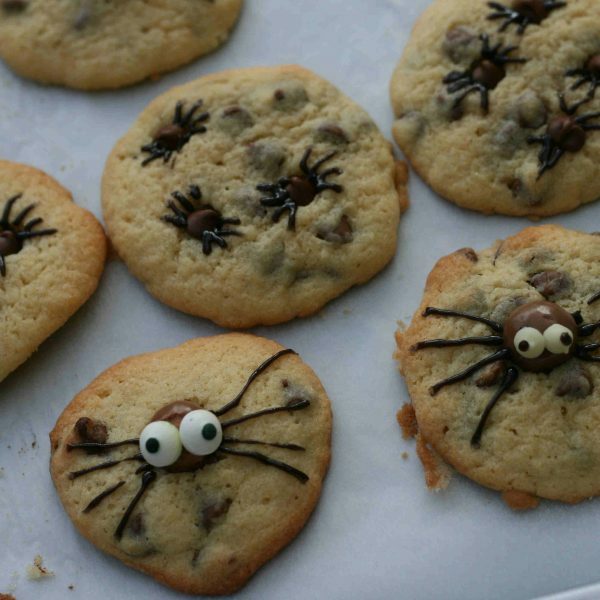 Spoon large teaspoons of the cookie mixture on to your prepared baking trays. Make sure you leave enough room for them to spread. Bake in the oven for about 8-10 minutes. They’re ready when they are turning golden. I like them a little gooey in the middle still. If you don’t cook them a minute or two longer. Don’t leave them in too long though as they’ll turn dark brown very quickly. 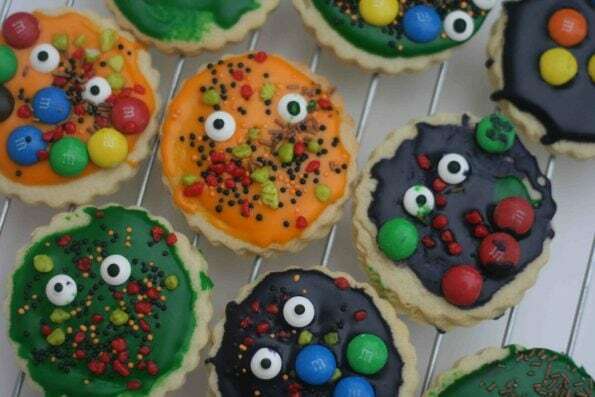 Remove the cookies from the oven and, if your little ones are helping to decorate them, carefully place them on to a wire rack. 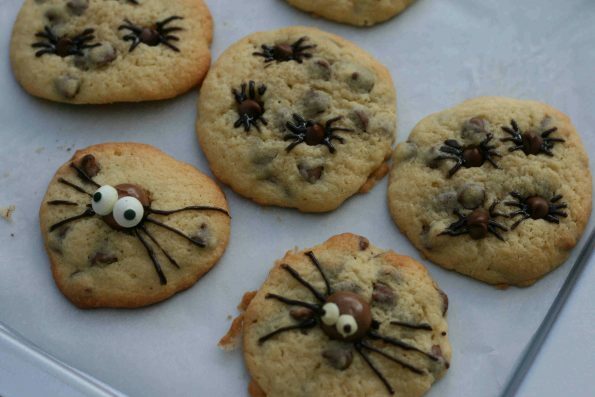 You can leave them on the baking trays if you’re doing it yourself, being careful not to burn yourself! 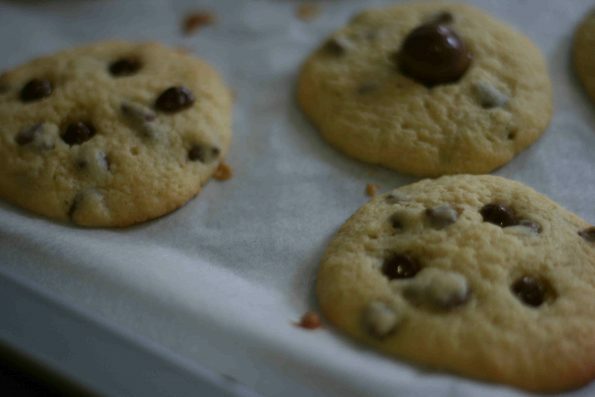 Add either a malteser or a few chocolate chips to each of your cookies while they’re still warm. 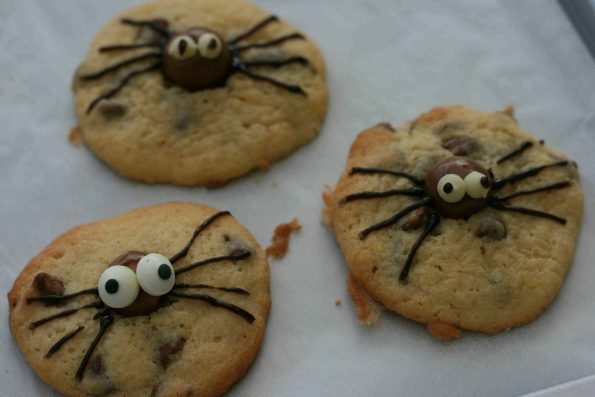 Let them cool a bit, then draw the spider’s legs on with the black writing icing. Melt a sqare of chocolate and use that to stick the candy eyes on to your maltesers. Enjoy! The cookies will keep for a few days in an air tight container. Preheat your oven to 190C/180C Fan / 375F and line 3 baking trays with baking parchment/paper. Measure butter and pop it into a large mixing bowl or freestanding mixer. Measure the sugar and add to the mixing bowl. Measure the vanilla extract and add to your mixing bowl. 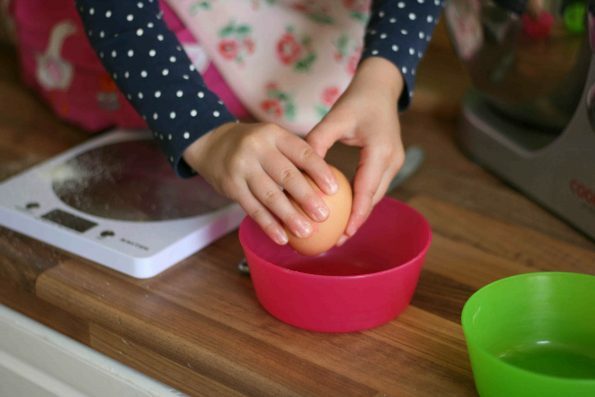 Crack the egg in a small bowl. Give it a little whisk and then add it gradually to your mixing bowl, beating it well between each addition. Weigh the flour into a small bowl then add to your mixture. Finally add the chococlate chips and give it one final mix. 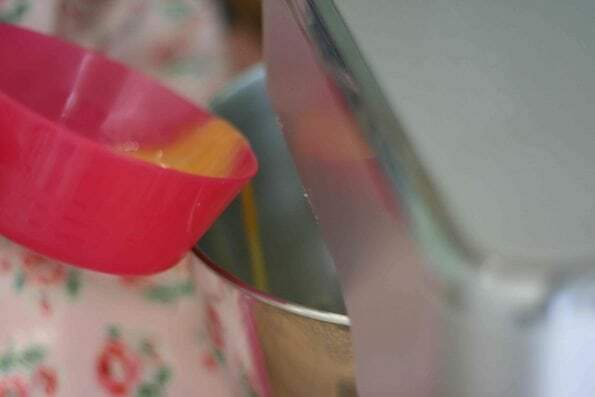 Spoon large teaspoons of the cookie mixture on to your prepared baking trays Make sure you leave enough room for them to spread. Bake in the oven for about 8-10 minutes. They’re ready when they are turning golden. I like them a little gooey in the middle still. If you don’t cook them a minute or two longer. 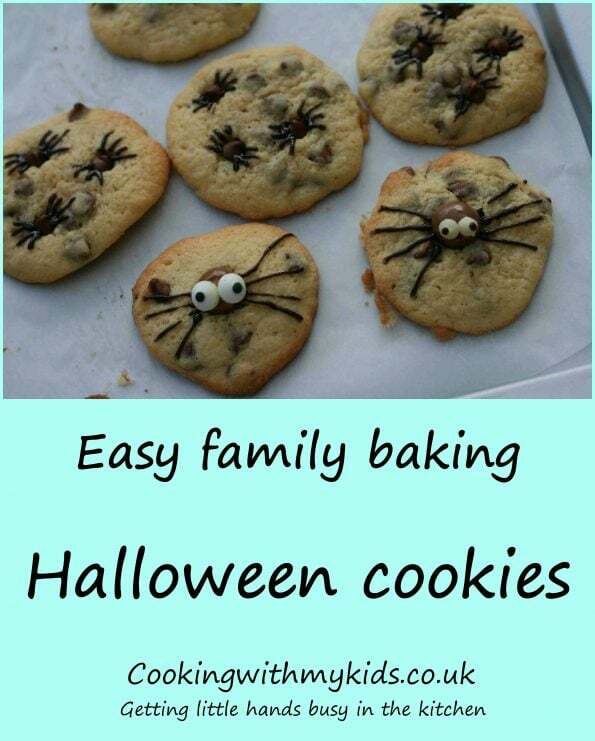 Remove the cookies from the oven and carefully place them on to a wire rack. 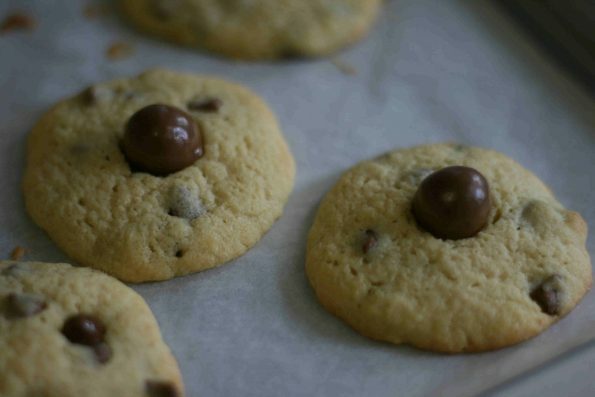 Place a few chocolate chips or Maltesers on them while they are still warm. 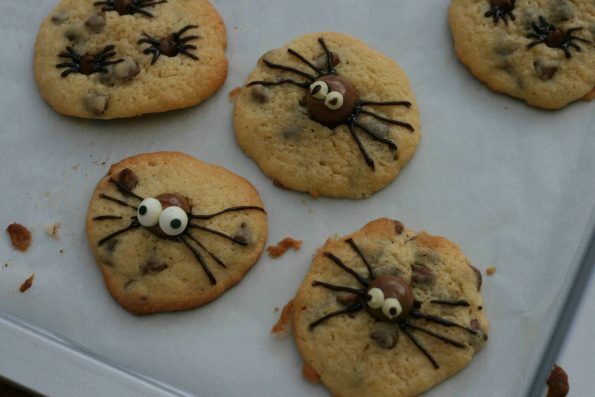 These will form the spider’s bodies. 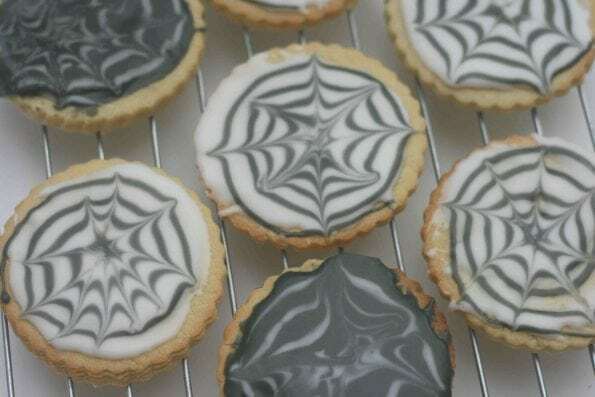 Leave them to cool a bit more and then pipe the black icing on to create the legs. Thanks, we took them to a toddler group and they were gone in seconds. I think they couldn’t resist the bonus Malteser!